Waxman Ceramics. 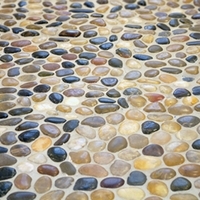 River Pebbles Mosaic Floor and Wall Tiles. Natural stone polished pebble effect mosaic tiles on a mesh netting.